But soft, what light through yonder taxi window breaks? This, this light through yonder taxi window breaks. The breaking light is coming from an art installation sun commissioned by Tropicana. When I first heard about this I was impressed. I was impressed because it ain’t easy being a packaged goods brand in digital spaces. If you’re a tin of soup or a carton of orange juice, being interesting doesn’t come naturally. You have to work at it. And Tropicana had obviously worked at it. Here’s the the video of them working at it. As I say, I was impressed. Martin Weigel has written two posts recently about how being interesting is more important than being different. John wrote about how advertising should be the story of amazing things that you’ve done. If your product is not a Social Object, why are you in business? On the face of it this art installation from Tropicana is a valiant attempt at all of these things. But, rather than applaud them for working at being interesting, a lot of people have decided to criticise them for trying too hard. Conceitedly concerted. Or concertedly conceited. That must hurt when you’re going out of your way to do something more interesting than a typical interruptive ad. Indeed the overall dislike to like ratio for the video on Youtube is high – 57% at the time of writing. And the Exhibit A reaction shot above is specifically targeted by the hecklers. How much was the lady in the cab paid to look on in wonder? Maybe about the same as this guy. Only this guy isn’t looking at a giant sun. 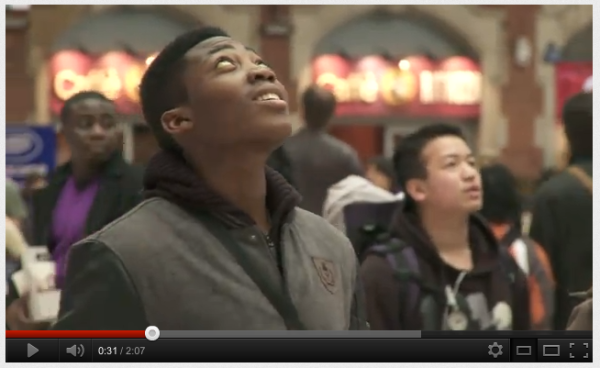 This guy is looking at angels falling into Victoria Station. This guy is staring in wonder at a large scale augmented reality version of the Falling Angels commercial by Lynx. Lynx is working hard to be interesting. In the video below Lynx is telling the story of a thing that it has done. Lynx is making a social object out of an advertising idea. But, unlike the Tropicana film, its dislike to like ratio is relatively low – under 3% at the time of writing. Both brands created something interesting, unusual and with scale in public places. Both brands filmed their events to tell the story of what they’d done to a wider audience. Both brands are owned by big, global corporations. Both brands have issues in everyday life. But one gets panned by a large proportion of its viewing audience. The other comes through unscathed. I’ve watched both videos several times in search of an explanation. And I think it comes down to executional detail. The reaction shots in the Tropicana video are clearly set up. The whole thing feels like a feature production. Like an ad. There are more wide shots in the Lynx video. There are genuine looking and sounding vox-pop testimonials. It feels more like a making-of video. My conclusion, therefore, is that your content strategy really is hanging by the thread of executional detail. The hard work that you put into being interesting has to feel effortless. Otherwise you’ll find yourself living in “interesting times”. Thanks Tom. That’s a great example. I hadn’t seen or thought about the wording on the T-shirts but it’s so true. “Everything communicates” is spot on.